Quite often, I’m asked for advice on where to see volcanoes in Hawaii. The answer is both simple and tricky. You’ll soon see what I mean. All the Hawaiian Islands were created from volcanic eruptions, though most of the volcanoes that formed the Hawaiian island are extinct or dormant. From the oldest island, Kauai, to the newest island, Hawaii’s Big Island, you can see remnants of volcanic shaped mountains, formerly active lava flows and craters. When you visit each island of Hawaii, you see that you are on land that was formed by a volcano. I’ll provide two typical examples to illustrate Hawaii’s volcanic history. The first example is that many of Hawaii’s beaches are flanked by lava rocks jutting into the ocean. 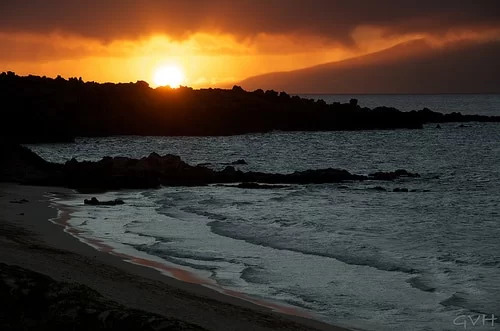 Here’s a photo of the sun setting behind lava rocks that flank Oneloa Bay Beach in Kapalua, Maui. Perhaps Hawaii’s most iconic volcano remnant is the crater Le’ahi, which is more commonly called Diamond Head. 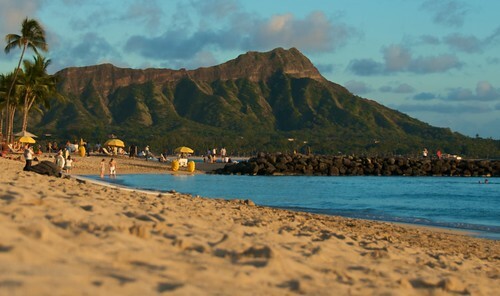 This volcanic crater anchors Hawaii’s famous Waikiki Beach on Oahu. If you want to see volcano activity, such as active lava flows and churning lava, Hawaii’s Big Island is the only place to see that in Hawaii. Both Kilauea and Mauna Loa on Hawaii’s Big Island are active volcanoes, with Kilauea being the most Hawaii volcano active in recent history. UPDATE: Kilauea volcano has not been actively erupting lava since August 2018. It may start again, but we will have to wait and watch. See this article for how to find out where the lava is active on Hawaii’s Big Island to be able to check the latest activity. At the moment Kilauea is producing several active spots that are thrilling to see on land or by helicopter. From Hawaii Volcanoes National Park, you can see the crater Halema’uma’u glowing with a billowing flow of volcanic smoke from the churning lava lake that’s below the surface. Halema’uma’u glowing at dusk. Note that this photo was taken before the lava pause in August 2018. Kilauea is actively producing a lava, though the flows are not always active and easily visible/accessible from the ground. To summarize – volcanoes are actually everywhere in Hawaii, but for activity, your best bet is Kilauea on Hawaii’s Big Island — when it is actively erupting lava. All of Hawaii’s volcanoes are worth seeing, but definitely don’t miss the opportunity to catch the lava flowing, if you’re on the Big Island of Hawaii. I am of the opinion that visiting Hawaeii would be a life time experience. I am a retired professor of Geology and want to see the active volcanoes. We have pillow lavas etc in Pakistan but Hawaeii islands are the places where one can observe active volcanoes easily. I am planning to visit at affordable prices and hope someone will guide me. Thanks. I want to. Is it more than one island. Someone told me I should take a cruise ship from Hawaii that goes to each island. Is that possible and how do I get information regarding doing that.